According to June 2010 BP Statistical Energy Survey, Malaysia had proved oil reserves of 5.5 thousand million barrels or 0.4% of world total at the end of 2009. Production was 740 thousand barrels daily, a drop of 3.7% compared to 2008 figures. Regarding natural gas, the same report stated that in 2009, Malaysia has proved reserves of 2.38 trillion cubic metres or 1.3% of world total. Production was 62.7 billion cubic metres, which was a 3.3% decline over 2008 figure. The country's major domestic oil production occurs offshore and primarily near West Malaysia. Malaysia has 106 marginal oil fields containing 560 million barrel of oil with PETRONAS planning to develop 25 percent of them. All downstream activities are regulated and administered by the Ministry of International Trade and Industry (MITI) as well as the Minister of Domestic Trade Cooperatives and Consumerism; the latter regulating the marketing and distribution of petroleum products. Under the National Petroleum Development Act, Petroleum Nasional Berhad (PETRONAS) was incorporated on August 17, 1974 with sole ownership and exclusive exploration and production rights of oil. It regulated all up-stream activities. All foreign and private companies must operate through Production Sharing Contract (PSC) with PETRONAS. Currently, many major oil companies such as ExxonMobil, Shell, Nippon Oil and Murphy Oil are involved in such contracts. As a result, 40% of oil fields in Malaysia are developed. Through its exploration and production (E&P) subsidiary, PETRONAS Carigali Sdn Bhd, PETRONAS has developed capability as a hands-on operator with track record of successful oil and gas developments. Malaysia currently has about 515,000 bbl/d of refining capacity at six facilities. PETRONAS operates 3 refineries (259,000 bbl/d total capacity), and ExxonMobil operates one (86,000 bbl/d). PETRONAS refinery in Melaka is a joint venture with ConocoPhillips, which produces a full range of refined petroleum products. In 2009, Malaysia had proved natural gas reserves of 2.38 trillion cubic metres, 1.26% of the world's total. In 2009 natural gas production was 62.65 billion cubic metres or 2.09% of the world total. Malaysia's natural gas consumption in 2009 was 31.45 billion cubic metres, amounting to 1.06% of the world's total. Gas exploration and development is mainly concentrated in the Malaysia-Thailand Joint Development Area (JDA), located in the lower part of the Gulf of Thailand ad governed by the Malaysia-Thailand Joint Authority (MTJA). The gas sector is also dominated by PETRONAS. Though Malaysia's oil and gas fields are maturing, new developments are expected to offset the decline in production. In late 2010, Total signed an agreement with PETRONAS, acquiring an 85% interest in Block SK317B which is located 100 km offshore in Sarawak. In another development, in early 2011, PETRONAS announced that it made new major discoveries in oil and gas as a result of drilling the NC3 well in Block SK316 and Spaoh-1 well in SK306. The NC3 well and its appraisal well in Block SK316 have an estimated 2.6 trillion standard cubic feet of net gas. Drilled in December 2010, Spaoh-1 has 100 Million barrel of oil and 1.2 trillion standard cubic feet of gas. For 2011, PETRONAS will see further expansion with the completion of the Gumusut-Kakap floating production storage, Kebabangan offshore structure and Malikai tension leg platform. In April 2011, two more marginal field contracts will be awarded by PETRONAS. 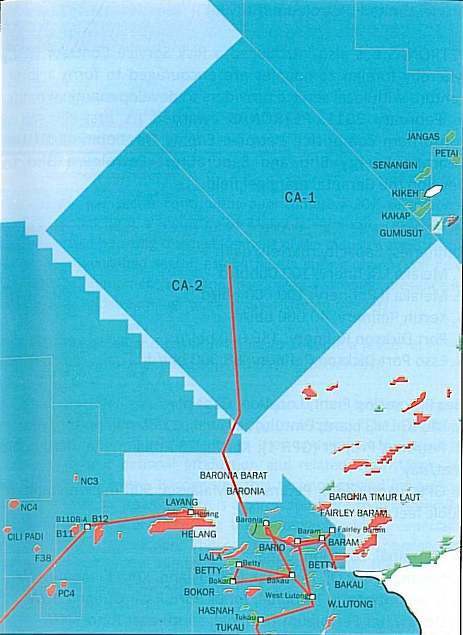 In 2011, deepwater Block CA-1 (formerly Block L) which covers an area or more than 5,850 square Kilometres was awarded to consortium consisting of Total E&P Brunei B.V., BHP Bilton Limited, Hess Limited, PETRONAS Carigali Overseas and Murphy Pil Limited. Block CA-2 (formerly Block M), covering 4,944 sq km was awarded to a consortium comprising Murphy Oil Corporation, PETRONAS Carigali Overseas, and Canam Brunei Limited (Petroleum Brunei). PETRONAS has also introduced a Risk Service Contract (RSC) whereby foreign companies encouraged to form a joint venture with local service providers to develop marginal fields. 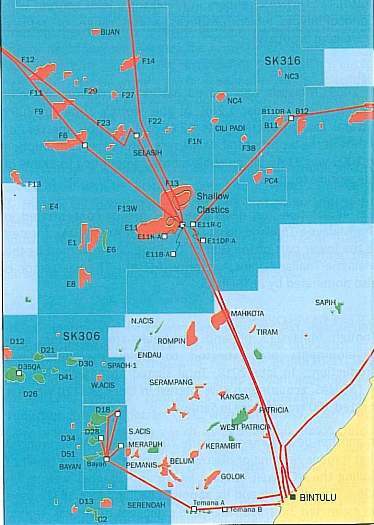 In February 2011, PETRONAS awarded its first RSC to a consortium comprising Petrofac Energy Development of UK, Kencana Energy Bhd and SapuraCrest Petroleum Bhd to develop the Berantai marginal field.